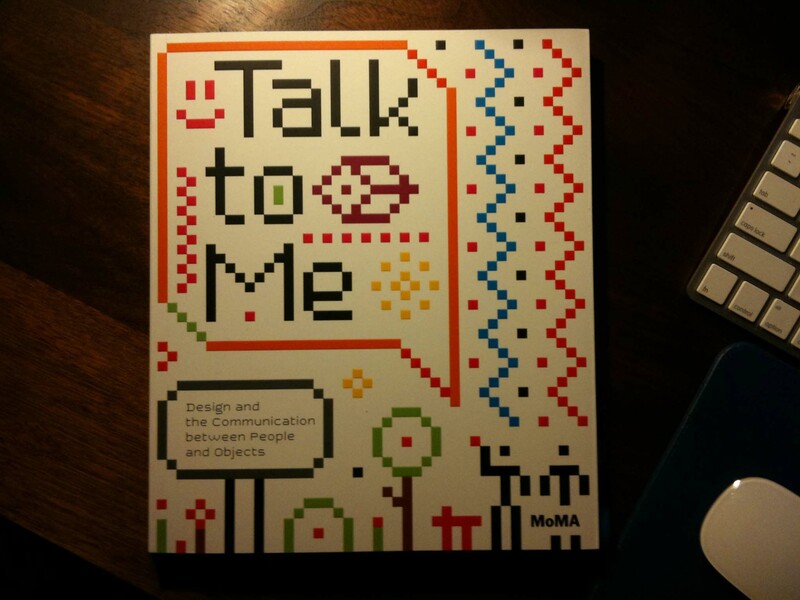 I’ve been asked by an academic journal to write a review of MoMA’s “Talk to Me: Design and the Communication Between People and Objects” exhibition. But because this is academic publishing we’re talking about, that review probably won’t see the light of day for at least another year. Given how incongruous that temporality is with the instantaneity defining the objects in this exhibition, I figured I’d take advantage of this forum right here, a means for more immediate communication, to post my initial thoughts. We’re greeted, loudly, by Talking Carl, a “box-shaped creature” grown famous through smartphone apps, whom the younger museum-goers delight in tickling, spinning, prodding, and bouncing via a wall-mounted control pad. The long hallway leading to the third floor’s eastern gallery is lined with flatscreen monitors featuring what seem to be the more “performative” projects in the show: a “real human interface,” a talking chair, interactive public art projects. Also here we find a project I know well: Timo Arnall, Einar Sneve Martinussen, and Jack Schulze’s (of the fantastic BERG group) “Immaterials: Ghost in the Field,” a visualization — and, more importantly, an explanation of the significance of this visualization — of RFID interactions. 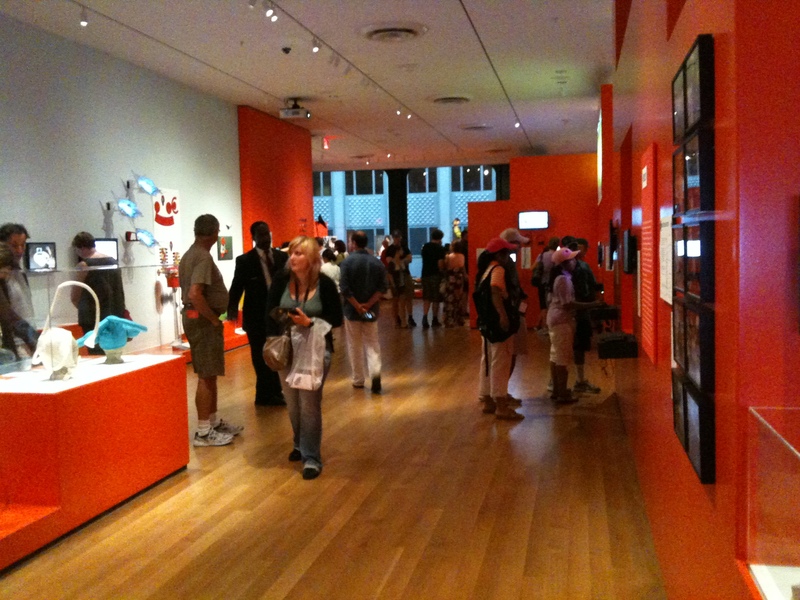 A cordon with sign directs those who wish to engage with the video works to stay to the right, and those who wish to pass through to the gallery to stay to the left. Few heed the sign, rendering the entire hallway an obstacle course. Perhaps we should take this communication failure as our first clue: physical text-based signage is obsolete. 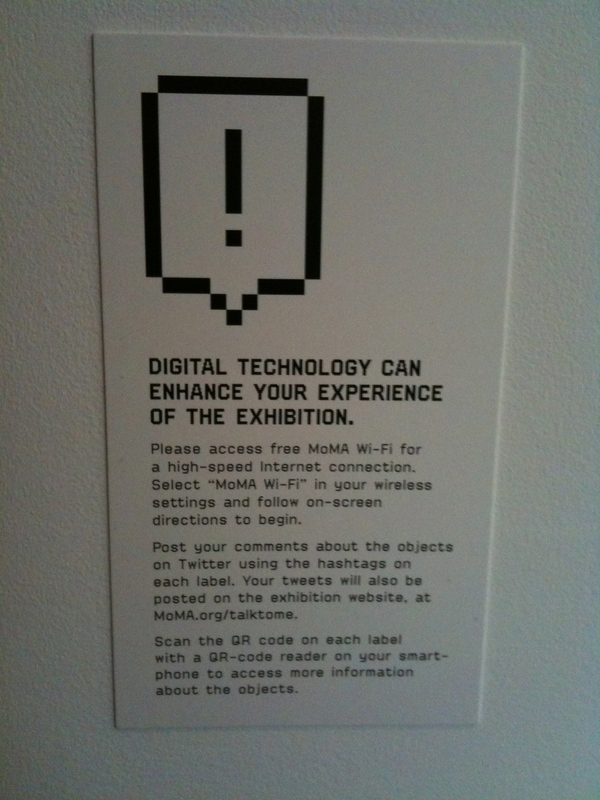 This is the land of locative media and QR codes, which appear on each object’s wall text, linking viewers to additional information online. For an exhibition that is so self-consciously futurist, the pixelated font on all exhibition graphics seemed an odd choice to me. Was this some ironically retro aesthetic, or an appropriately timed (given the centenary of McLuhan’s birth just three days before the show opening) homage to early Wired, which planted the conceptual seeds for much of what we were about to see in the gallery? 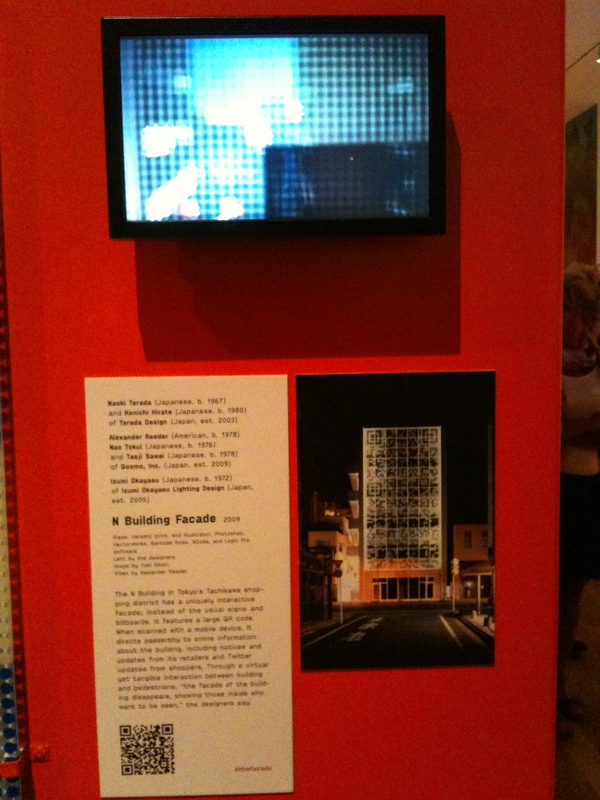 Fittingly, a “global village” contributed to the development of both the exhibition’s content and form. 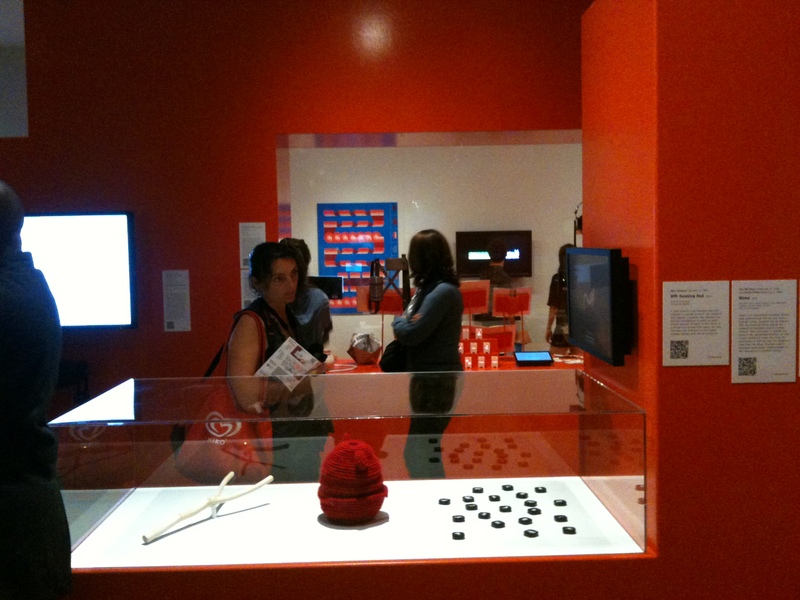 Since March 2010, curators Paola Antonelli and Kate Carmody maintained a “Talk to Me” blog where they solicited and sorted through recommendations for objects to include in the show (whittling down 1500 suggestions to roughly 200), discussed installation ideas, etc. 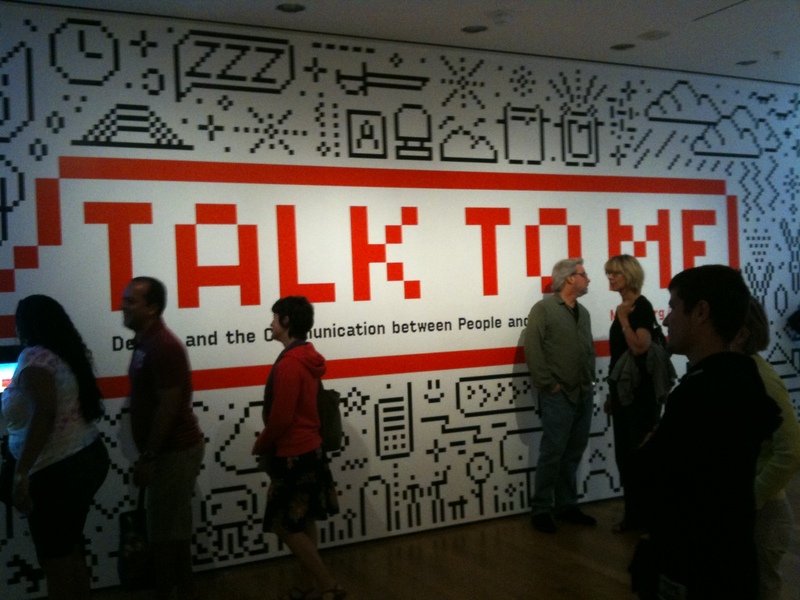 Conversational prompts on the blog indicate that the curators initially conceived of the exhibition in terms of format or genre: computer games, data visualization, interfaces, installations, etc. Some of these categories focus on who or what is communicating, and how. Others are oriented toward the scale, or the subject or content, of communication. What ontology is implied by this rather tangled taxonomy of object-human-communication? Or maybe it doesn’t matter. The age of interaction has supposedly rendered ontologies obsolete. Now, it’s supposedly all about links and tags — and there are links and tags aplenty in this hybrid physical/virtual exhibition. In your typical exhibition, visitors can engage with the works on display with or without heeding the curators’ conceptual or thematic categories (most of the time they’re quite a stretch anyway). Here, you can’t help but want some guidance — because the objects themselves are so perplexing. I found myself relying on these one-word themes to help me navigate and make sense of what I was seeing. And I found myself playing with these concepts in my own mind and wondering why certain objects were classified as they were.That may very well just be me, though; I’m sure plenty of other visitors were able to simply enjoy the 200 objects for what they were: 200 awesomely clever thingamajigs. The implication is that each of these categories represents a different type of communication. Those differences lie not only, as the curators suggest, in who’s talking to whom, but also in how they conceive of what communication is. Are hand-drawn maps; finger implants; ATM interfaces; biometric machines; Marguerite Humeau’s Lucy from Back…, which recreates the voices of extinct animals; Sputniko!’s Menstruation Machine; and Gerard Rallo’s Devices for Mindless Communication, which recognizes patterns in our everyday conversations and coaches us through “small talk,” all engaged in the same activity? Is “communication” a sufficiently expansive concept to encompass this widely diverse activity? Antontelli writes in the exhibition catalogue that the exhibition “thrives on [an] important late-twentieth-century development in the culture of design, which can be described as a shift from the centrality of function to that of meaning, and on the twenty-first-century focus on the need to communicate in order to exist” (7). “Meaning” is central to certain conceptions of communication, like semiotics. But meaning is bracketed out of others, like Shannon and Weaver’s mathematical theory of communication, which is all about signals passing through channels, from sender to receiver, dodging noise in the process. It’s hard to know what “meaning” means in some of these projects — and across these projects, in the exhibition as a whole. Regardless, how might this supposed shift to meaning, and the near-ubiquity of interaction, be altering what we mean by “communication”? Antonelli claims that “the key to effective and elegant communication is choosing the right [medium or channel], the right interpreter. The most recent technology, in other words, may not be the most appropriate” (9). I’m not sure that a gallery exhibition was the “right interpreter” for much of this work — in large part because the objects themselves rarely “effectively and elegantly” communicate what they are. A display case full of iPod-esque gadgets, metal canisters, and expressionless plastic toys is reduced to a case full of “stuff” — unless one puts in the effort to read the lengthy text panels and watch the accompanying videos. What's that? A dowsing stick, a hand-knit beehive, and a bunch of chocolates? These “captions” serve, in Barthesian fashion, to both “anchor” the object — to explain what, exactly, that rubber doodad does — and “relay” its connection both to the other geegaws and widgets in the case, and to its thematic unit within the exhibition. Antonelli quotes Alice Rawsthorn, who notes that “the appearance of most digital products bears no relation to what they do” (quoted on 10). The “objects” themselves often fail to talk to us formally, and require more traditional language-based media to “interpret” for us what they are. All this translation requires an immense investment of time on the part of the visitor. Not to mention the “noise” created by the traditional museum interferences: oblivious tourists cutting off your view of the video screen, your own back and feet screaming at you to sit down already! The same group of people <ahem> always seemed to be standing right in front of what I wanted to see. 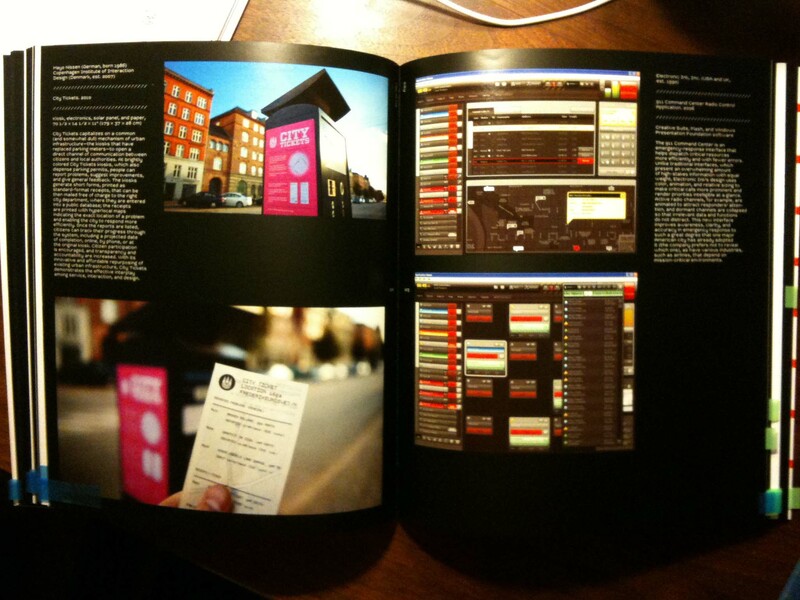 The catalog contains project images and descriptions and, in some cases, QR codes. 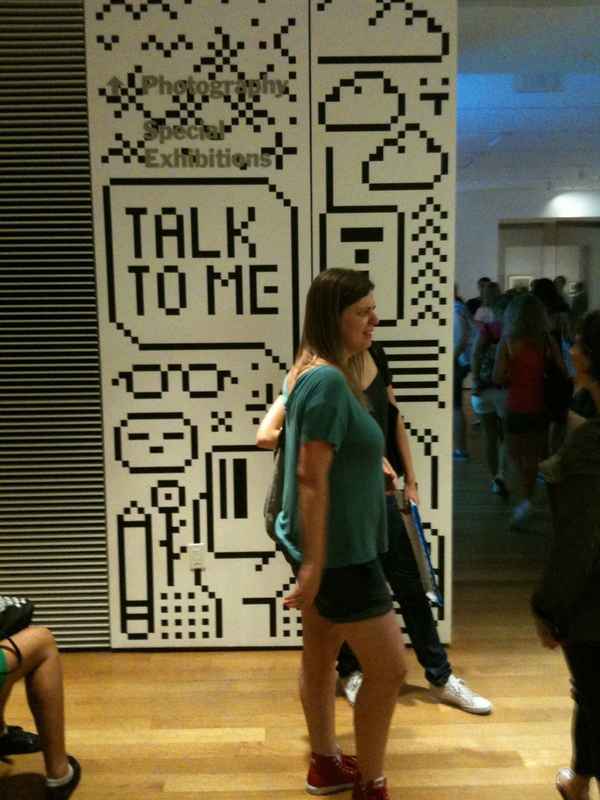 The exhibition of course talks to us formally, materially. Only an on-site viewing of the real object allows us to perceive its textures and scale, to observe its blinking lights, to appreciate just how loud and chilling its squeals and squawks can be. But all this is just stimulus until we know what those textures and blinking lights mean, what they denote and connote. That’s where the “captions” — texts, videos, etc. — come in, but these captions don’t lend themselves to easy consumption in the gallery space. I also wonder if the objects’ meaning might’ve been even more effectively and elegantly translated if the museum had created opportunities for users to either experience first-hand, or observe first-hand, the objects in action. Communication is a process — not a thing. Perhaps a series of live performances of these objects talking, communicating, might’ve better suited the ethos, the experience, of interaction design. Total brain dump. I’ll have to majorly cut this down and tighten it up.